Microsoft’s push to make its Bing search engine more social will take it in a new direction—actually letting a select group of users curate results. Microsoft’s “experiment,” known as Bing Boards, will allow a small group of food and lifestyle bloggers, experts, and social influencers to cultivate their own selection of search results on a given topic. The Board will be a visual collection of images, videos and links that tell the story from the blogger’s point of view, Microsoft said. These results won’t replace the search result that Bing normally returns, but will sit alongside them within the middle column of Bing’s search results, Chen Fang, program manager of Bing Experiences, said in a blog post. Microsoft said that it will use a team of editors to bring on new contributors with content that “shares an interesting point of view and is visually unique,” a spokesman said an email, factoring in metrics such as traffic and online influence as well. 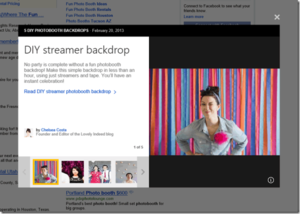 In an example search, searching for “photo booth backdrop” generated a Bing Board by Chelsea Costa of Lovely Indeed, a DIY blog. All of the links within the Bing Board went to the Lovely Indeed site. “Bing Boards are another way for creative online influencers to express their words, images and point of view on their passions and reach readers who are interested in the content they are producing,” Microsoft representatives said in response to a question about whether bloggers would be responsible for curating third-party content. Microsoft said that the Bing Boards are but one of hundreds of minor tweaks Microsoft engineers apply to the site on a regular basis. “Most are nearly invisible, ranging from small tweaks to the search algorithm, to changes in our ad selection, to optimizations in the color, size, and placement of features,” Fang wrote. 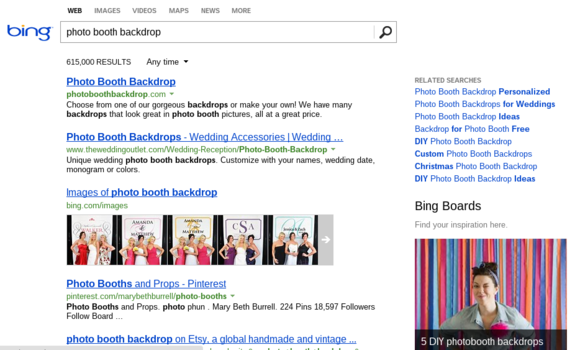 The Bing Board appears to the right of search results. About 17.4 percent of all U.S. search results are returned via Bing, according to May data collected by comScore. That puts Microsoft a distant second to Google, which controls 66.7 percent of the U.S. search market. In 2010, Microsoft and Facebook joined forces to create an instant personalization feature for search results, with some results tagged as “Liked by your Facebook Friends.” The partnership grew closer over time: Microsoft added a “social” column to allow users to ask questions of Twitter and Facebook friends, and then integrated results if those friends had commented, liked, or referred content from a variety of social networks, including LinkedIn and even Google+. Bing even allowed users to search Facebook Photos, if logged in, via a feature that predated Facebook’s own Graph Search.